The Mountain West football season is less than a week away and it’s time to run down some aspects of the league and get everyone familiar with what we should be looking for this season. There are quite a few topics to cover and hopefully it’ll answer any outstanding questions fans might have about the conference and their team’s rivals. These are my opinions on the Mountain West and if you don’t like it, feel free to leave a comment and argue with me. 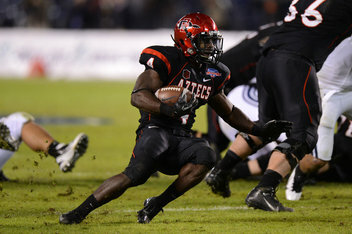 Best Offensive Player: Adam Muema, running back, San Diego State. I’m going out on a little bit of a limb on this one here, but follow me. Muema has a legitimate chance to be the Mountain West player of the year. The junior running back for the Aztecs rushed for 1458 yards last year and 16 touchdowns helping the team to one of their best seasons and a co-Mountain West championship. Against Wyoming he went absolutely absurd and rushed for 255 yards and 4 touchdowns. I would expect Muema to rush for more than 1500 yards this fall. My apologies to Derek Carr. Best Defensive Player: Jake Fely, linebacker, San Diego State. Fely is a returning 2nd team Mountain West selection. He ranked 4th in sacks, 6th in tackles for loss, and 14th in tackles per game. The junior linebacker from Oceanside, CA is looking to improve on those numbers and I believe he has a legitimate chance at defensive player of the year. Mountain West Connection has Fely ranked as the 13th best player in the league. He’ll have to beat out Fresno State safety Derron Smith and San Jose State corner Bene Benwikere if he wants to be the best in the Mountain West. Best Coach: Chris Petersen, Boise State. I’m not sure this is even much of a conversation. The Boise State head coach took over for Dan Hawkins in 2006 and has the Broncos rolling to one of the most impressive runs in modern college football history. Petersen has racked up a 84-8 record since he has taken the reins of the Broncos. He has won 4 WAC championships and 1 Mountain West championship to date. Named Bobby Dodd coach of the year in 2010. The Broncos have two undefeated seasons under his watch as well. 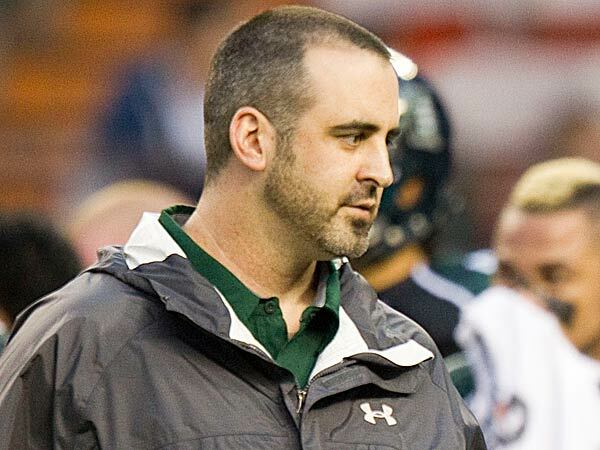 Best Assistant Coach: Nick Rolovich, offensive coordinator, Nevada. The former Hawaii Warrior is making a name for himself in the college football ranks and his latest project is to transform Cody Fajardo into the best quarterback in the Mountain West. Last year under Rolovich the Wolfpack ranked 7th in total net yards, averaging 526 yards per game. They ranked 51st in passing and 7th in rushing. The Wolfpack also ranked 18th in points per game. This year Rolovich will be without Chris Ault in favor of Brian Polian. Will the Wolfpack offense miss a beat? Coach on the Rise: Bob Davie, New Mexico. Bob Davie took over the New Mexico Lobos after Mike Locksley almost literally set the program on fire and watched it burn. The Lobos were 3-33 under Locksley. Bob Davie came in and totally revamped the program, moved the Lobos to a rush first offense on the legs of running back Kasey Carrier and quarterback Cole Gautsche. The Lobos finished 2012 with a 4-9 record, their best record since 2007. Their schedule sets up nicely this year and should easily hit 4 wins, maybe a few more. Coach on the Decline: Norm Chow, Hawaii. It’s probably not fair to judge Chow after one season at Hawaii but I just can’t see the Warriors improving while he’s there. Unless transfer quarterback Taylor Graham lives up to the hype of being the next big thing on the islands I just don’t see this team doing much. There’s not a lot of talent on this team. The only wins for the Warriors last year were over two transitioning FBS teams and an awful UNLV team. The Warrior defense gave up an average of 35 points, including 69 to Nevada. There are no gimmes on the schedule for the Warriors this year, but games vs. Army and UNLV should give them their best opportunity for victories. Coach on the Hot Seat: Bobby Hauck, UNLV. Hauck’s seat might as well be fresh lava at this point. Hauck’s Rebels have not had more than 2 wins over the course of the last 3 seasons. The Rebels also have 2 losses to FCS teams in that time span. Hauck brought in his brother, Tim, to run the defense this season to hopefully stave off being fired for at least one more season. There are no easy games on the schedule when you’ve only had 6 wins in the last three seasons, but the best chance for UNLV to get a win this season is FCS Western Illinois and Hawaii, both home games. Biggest League Game: Boise State Broncos vs Fresno State Bulldogs. This game needs no introduction. Unless somehow a couple teams sneak in wins this will be your matchup in the first ever Mountain West championship game, held at the home of the team with the best record. These two teams face off early in the season, then could possibly rematch with a bid for a BCS bowl game on the line. The Bulldogs led by Derek Carr and the Broncos led be a host of players could make for the most entertaining matchup in the Mountain West this season. 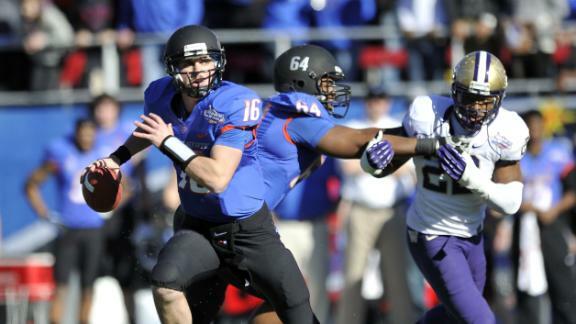 Best Non-League Game: Boise State Broncos at Washington Huskies. Right now the Broncos are 3.5 point underdogs to the Huskies. The Huskies are coming off of a 7-6 season, including a Las Vegas Bowl loss to the Broncos last season. The Huskies were incredibly uneven last season as they were pounded by ranked LSU, Oregon, USC and an ugly loss to Washington State but recorded wins over Stanford and Oregon State. The Huskies will debut their newly remodeled Husky Stadium against the Broncos from Boise. Washington is led by senior quarterback Keith Price who tossed for 2728 yards and 19 touchdowns and junior running back Bishop Sankey who rushed for 1439 yards and 16 TDs last season. Breakthrough Team: New Mexico Lobos. As stated above, Bob Davie has brought a new energy into the New Mexico Lobo football program. He’s done it in a way that no one would thought would work, which is become a run-first offense (unless your name is Air Force). Davie took a few years off between head coaching jobs and saw quite a bit of success upon his return. Will that translate to sustained success? Hard to tell, but right now the Lobos are looking like a football team again. Best Rivalry: Wyoming Cowboys and Colorado State Rams. There are only a couple of rivalries in the Mountain West that are true rivalries and this one takes the cake. Pokes and Rams has happened every fall since 1899. The Rams currently lead the rivalry 55-44-5. The two teams play for the Bronze Boot, a boot worn by a Colorado State alum in the Vietnam War. The Cowboys are currently on a 4 game winning streak against the Rams and will face off on October 19th in Laramie. Best Stadium Atmosphere: Air Force. Air Force features a terrific pre-game with the cadets marching into the stadium, the Falcon flying overhead, and of course, a chance of a fly by. The Falcon Stadium is located in a terrific place with an even better backdrop. When the Falcons are playing well the stadium becomes one of the better places in the country to watch a football game. Best Tailgate Scene: Boise State. Lots of people. Lots of food. People who love football. Particularly friendly to out of town visitors. Best Town: San Diego. Weather. Beaches. Easy to travel to. Terrific food. Is there anything I’m missing?